Hello and welcome to the 104th installment of the SWD. Syrian Arab Army made big advances south of Deir Hafir, over a dozen of villages were captured and SAA reached Al-Humorat lake. Localities captured south of Deir Hafir include Wadi Muwaylih, Hamidiya, Ramadan, Khirbet Hassan, Umm al-Hawra, Shiha, Al-Batoushiya, Khirbet al-Thib, Tasat, Abbas, Mustariha, Karmah, Mawalah Saghir, Mawalah Kabir. 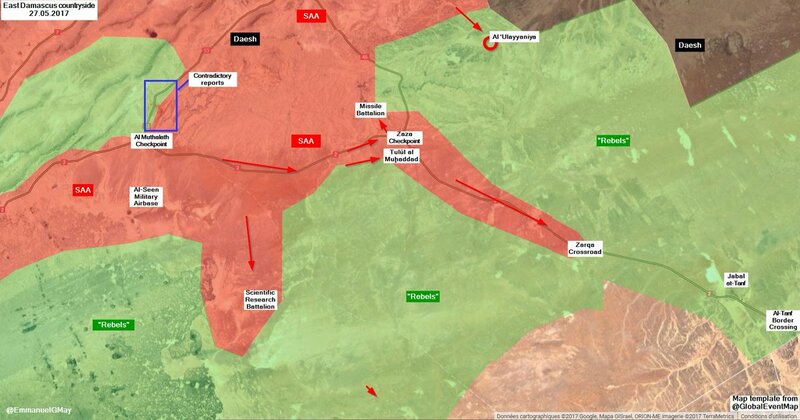 SAA also made advances around Maskanah capturing villages of Al-Qari and Al-Bouduna as well as Maskanah Train Station and its surrounding area. 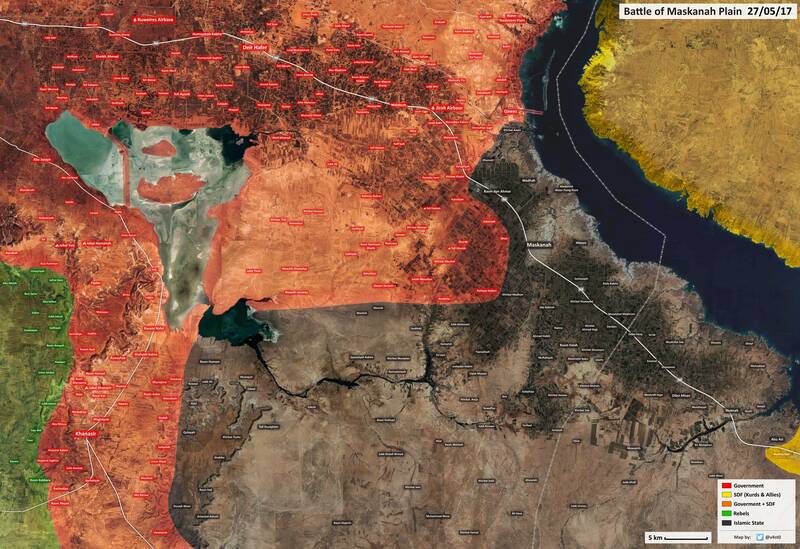 Syrian Arab Army captured Al-Ulainiyah and surrounding area from Free Syrian Army factions based in southeastern Syria. Unlike the previous false reports from two days ago, this time, Syrian Ministry of Defense reported the capture of the aforementioned locality. Last night, Hayaat Tahrir al-Sham killed three SAA soldiers as the latter tried to infiltrate area around Al-Hamidiyah. The event has been falsely reported by many as an Israeli drone attack which killed three SAA soldiers on the road between Al-Hamidiyah and Abu Shabtah. SAA & allies repelled yesterday’s FSA attack in Al-Zuluf area, but the latter launched another attack on the area. Pro-rebel sources claimed SAA lost a BMP, a Gvozdika and a MRLS in clashes with the rebels around Al-Zuluf Dam. Iraqi forces launched a final assault on the remaining IS-held districts in west Mosul, operation has started to fully secure the districts of Al-Shafaa, Al-Zanjili, Al-Saha and Old Mosul. After the first day, Iraqi forces reportedly captured 50% of the first part of Al-Shafaa district and around 30% of Al-Zanjili. 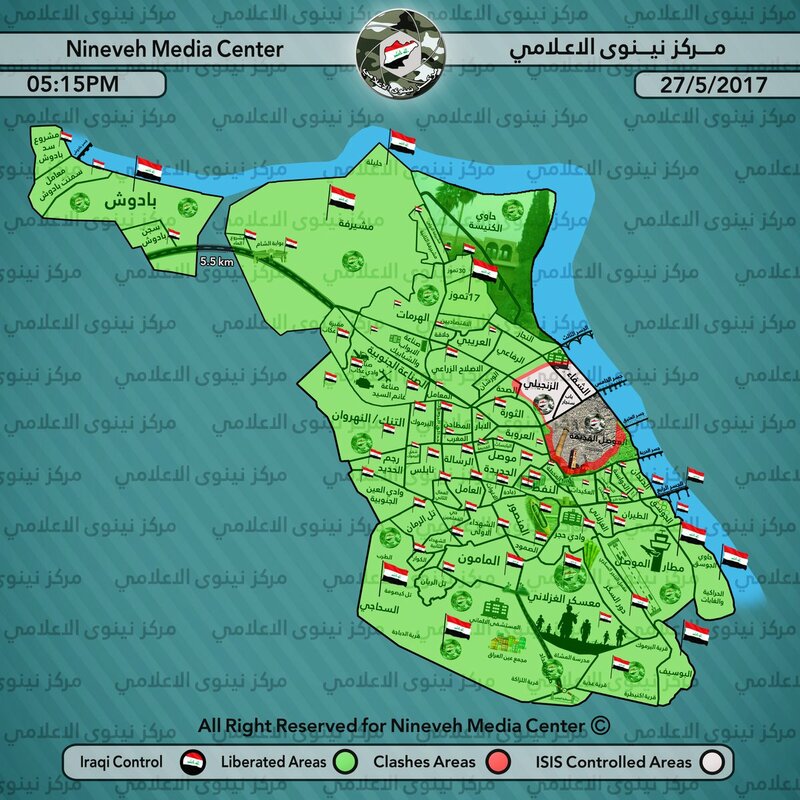 Some of the localities captured today include Mosul’s third bridge, Ibn Sina hospital and Mosul International Hotel. According to IS’ Amaq Agency, seven Iraqi soldiers were killed while storming the aforementioned hospital. Other IS claims from west Mosul include the death of five Iraqi soldiers that were surrounded in a building in Al-Zanjili district and death of another three Iraqi soldiers during the clashes also in Al-Zanjili district. Al-Hashd al-Shaabi (Popular Mobilization Units) captured the villages of Rambus Gharbi and Al-Adnaniya from Islamic State north of Baaj. Iranian military adviser in Islamic Revolutionary Guard Corps and commander in Quds Force (Sepah-e-Qods), Shaaban Nasiri was killed by Islamic State during Al-Hashd al-Shaabi’s operations north of Baaj. Mustafa Gunes, a Syria-based ISIS external operations facilitator from Turkey, was killed by a coalition airstrike near Mayadin, Syria, 27 April. He was identified as an ISIS recruiter in the central Turkish city of Konya. Gunes was linked to facilitating financial support for planning attacks outside Syria and Iraq against the West. Abu Asim al-Jazaeri, an ISIS external operations planner and a Syria-based French-Algerian ISIS fighter, was killed by a Coalition airstrike near Mayadin, Syria, May 11. Al-Jazaeri was involved in training a new generation of ISIS youths, called the Cubs of the Caliphate, a high priority training program sanctioned by ISIS leadership. Abu-Khattab al-Rawi, a senior ISIS military official, was killed during an operation near Al-Qaim in Iraq, 18 May. Al-Rawi was killed along with three other terrorists. Al-Rawi was an ISIS military official who operated in Iraq’s Al Anbar Province and provided direct support to ISIS leadership. Al-Rawi was responsible for coordinating UAV operations and procurement in Al Anbar Province in Iraq. On the 26th of May 2017 CJTF-OIR has conducted 18 strikes in Syria. CJTF-OIR‘s main focus in Syria at the moment is Tabqa-Raqqa-Deir al-Zour region where they did 16 strikes supporting SDF‘s operation against IS destroying four IS well heads, an IS boat, seven vehicles, five fighting positions, three tunnels, an IS headquarters and an ISIS staging area. Other area where two strikes occurred is Abu Kamal destroying a vehicle and an IS media center. Full report on CJTF-OIR strikes conducted in both Syria & Iraq can be found here.